It’s known to all that Bollywood actors Arjun Kapoor and Ranveer Singh are best of buddies. The Gunday actors have always entertained their fans with their crazy bromance. The two always appreciate each other’s work and are definitely bound by the strong ties of friendship. Ranveer and Arjun Kapoor have once again set friendship goals. Arjun Kapoor along with his co-star Shraddha Kapoor recently launched the trailer of their upcoming film, Half Girlfriend. The trailer sees Arjun Kapoor as Madhav in a helpless moment when Shraddha Kapoor as Riya, rejects to be his girlfriend. She rather wants to be his Half Girlfriend(Dost se Zyada, Girlfriend se kam). 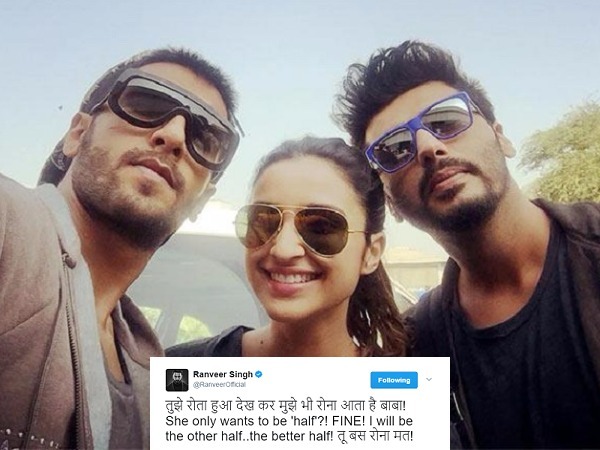 Arjun Kapoor’s Ishaqzaade co-star Parineeti Chopra also jumped into their conversation. Pari left Arjun in a dilemma by asking him to make a choice between her and Ranveer Singh. Arjun Kapoor had some amazing reaction, which only proved that how close friends Arjun Kapoor and Parineeti Chopra are. Also Read: Inside Photos: Sonam, Arjun, Jhanvi and Kapoor’s Enjoy Royal Family Wedding In Abu Dhabi! Previous : Troubles For Navjot Singh Sidhu For Cracking Double Meaning Jokes On The Kapil Sharma Show!